A new, low-cost portable pneumatic grommet attaching machine that features a built-in finger guard, carrying handle, and a convenient slug collection drawer is being introduced by METALgrommets.com of Dighton, MA. 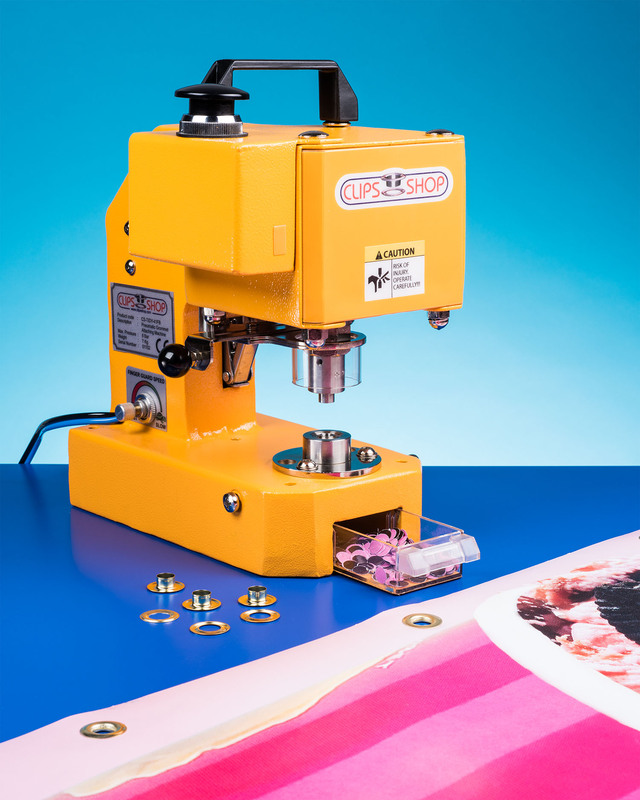 The ClipsShop® CS-TIDY-41 Pneumatic Grommet Machine is a safe and efficient way to attach metal grommets to banners, tarpaulins, and related products. Featuring a finger safety guard and a manual triggering mechanism, it weighs only 15 lbs., has a carrying handle, uses a hollow die and collects slugs in a drawer, and can be configured for push-button or foot pedal operation. Designed for attaching metal grommets from #XX00 to #5.5, the ClipsShop® CS-TIDY-41 Pneumatic Grommet Machine can be setup for right- or left-hand operation and the handle permits walking around large items. Powered by standard shop air, it has a dial for variable speed operation and an align-ment fixture is optional for fast, repetitive, and precise grommet setting. The ClipsShop® CS-TIDY-41 Pneumatic Grommet Machine is priced from $995.00. A full line of mechanical bench presses is also available.